Do Jamaicans accept him? Do they accept his work? Does he act Jamaican? What kind of insights does he have, having lived in Jamaica for a year researching dancehall music? Does he speak patois? These are only a few of the questions I wanted to ask him. Balford Henry reviewed Stolzoff’s book for The Gleaner, the daily Jamaican newspaper, and wrote, “I loathe supporting another exposé on Jamaican music and culture written by a foreigner. But, at least, I have to admit that Norman C. Stolzoff’s ‘Wake the Town and Tell the People’ is a genuine attempt to explain something we seemed to have overlooked.” High praise and acceptance from the source. One question down, many to go. Laura Gardner (LG): When you first arrived in Jamaica in 1994, how did you convince the Jamaican people that you had credibility and that they should talk to you? Norman Stolzoff (NS): It was a process that took time! For one thing, I had made arrangements with the African Caribbean Institute of Jamaica and they were able to sponsor me as a visiting fellow, so I had some credibility through the organization with which I was affiliated. More than that, I had been to Jamaica before, and knew something about the culture and the people. My training in anthropology really helped as I was sensitized; you read a lot about what it means to go to another place and to establish a rapport with the people. Plus I think I have a real affinity for Jamaicans and Jamaica. Those things, coupled with patience, I was slowly able to meet people. When I explained to people what I was doing, they were generally receptive because sound system culture, dancehall culture and even reggae have not really received that much scholarly attention. So, once they knew what I was about, they allowed me to interview them and I think people vibe you out in Jamaica. Once they sense that you’re “good people,” they trust you with more information and they give you more contacts and so forth. Of course there was the exception. There were some people who were non-cooperative or suspected my motives and/or wanted me to pay them some exorbitant amount of money, but they were the small minority. Many of these people were fellow observers of Jamaican music, formal musicologists or known as experts in the music scene. When dealing with another expert, especially a foreigner, there’s a sense of entitlement and encroachment on territory. As I discuss in my book, the information is power, and it’s economic. So I can understand not wanting to share intellectual property, as it were. After many futile attempts to contact these people, I decided to work with the people who were willing and there were, fortunately, dozens of people who I was able to talk to. One of the things about anthropology is that it isn’t only interviews… We also participate. It’s called participant observation. We try to immerse ourselves in the daily culture. There were hundreds, if not thousands, of people with whom I interacted with over the year that I was there, who I wasn’t formally sitting down and interviewing. Lots of people were interested and really generous with their knowledge and their time. LG: I know that dancehall lyrics are often thought of, in American culture, as menacing-the misogyny, the homophobia. How did you come to terms with perhaps opposing beliefs between American and Jamaican culture? NS: The first thing is that I tried to understand. Paul Gilroy is a very well known sociologist who studied the African Diaspora. He’s a Black British specialist on cultural politics. I draw a lot of inspiration from him and he says we shouldn’t be too quick to condemn or to celebrate. I took that as my operating principle and tried to step back and see: what are these lyrics? Who is generating them? Where are they being performed? Who likes them? I realized that Jamaica is not a monolith. It is not, “Jamaicans love slackness or gun tunes.” There are various positions within Jamaican society and different viewpoints about lyrics and dancehall in general. I tried to see controversial lyrics in a social/political/economic context rather than a literary, critical point of view where you find a song text and you break down the lyrics and say, “Well, that’s a misogynist lyric to be condemned.” Ultimately, I dismiss myself from those things that I think are objectionable-the violent misogyny and homophobia and so forth. That’s just the starting point. I don’t think you then reject everything, so I really tried to delve in deeper. LG: So expanding on that, where do you think these lyrics are coming from? NS: There are categories of songs. One is called “gun tunes” or gun lyrics. Those became quite popular in the late 80s and early 90s with deejays such as Ninjaman and Cutty Ranks. Gun tunes are part of sound system culture and sound systems are based on clashing. Not only that, but the young deejays are in a competitive sphere themselves… Gun lyrics were a way that they could make a name for themselves with their combative lyrics so they were able to compete in a violent style. But that begs the question as to why gun lyrics are popular. There’s a long history in Jamaica of the romanticized outlaw. Look at the hero of “The Harder They Come,” the gunman who is seen as a Robin Hood type of figure. Also there’s the importance of gangs in the inner city of Kingston. Gangs have become a kind of local political authority. There are many ways of looking at the role of the gunmen-there’s a positive perspective as the guardian of the community, as a provider. It’s somebody who is taking control of the situation. One must look at the context, which is that Jamaica is very violent, especially in Kingston where the police are notorious for their gun violence. Being able to defend oneself against the corrupt police is seen as heroic in the community. There’s something really defiant about them. Some of the gun lyrics are incredibly stirring. Others are ghetto reportage… And the music is so compelling that it’s not necessarily that they’re endorsing the gunmen. Often the songs are morality tales about the bad things that will happen to you. There’s a kind of graphic quality to them that is part of the dancehall aesthetic. It’s about putting things in ultra-realistic terms. Lyrics contain everything from endorsing random violence, to a more political defense against the police, to outright critiques of gun violence. So even within gun lyrics you have a whole spectrum of different political positions. I am a person who emphasizes complexity. I am not looking for a simple answer that gun lyrics are bad and songs about love and community are good and that’s it and we can go home [laughs]. LG: What are some of the other categories apart from gun lyrics? NS: Other categories would be “informer tunes” and I link informer tunes to what Jamaicans call “battyman” [anti-gay] lyrics. They’re about someone who is seen as betraying the social collective either in terms of security (the informer who spies and reports back to the police), or the battyman, who breaks the code of masculinity that is strictly enforced in Jamaican lower class culture, and really throughout society as a whole. I see these lyrics as a way of uniting against the outsider. Maybe the outsider is an insider who is expelled outside of the community. A clash is a very combative event where different people might be supporting different sound systems. When one of these songs comes on, it’s a way of bringing everyone in. That’s one of the darker and troubling aspects of the all-against-one unanimity that some of these songs are used for. It’s a long, tedious process trying to figure out where homophobia comes from. It is deeply viewed in the Protestant tradition that was brought to Jamaica and inculcated into the masses. There are lots of different origins, but I tend to take the functionalist perspective: what are these lyrics doing in terms of a social component? Then there’s a psychological component of what does it mean for a Jamaican man to consider homosexuality other than an abomination? Then there’s the misogyny question. There have been people like Carolyn Cooper; she’s a Jamaican professor of English who is really one of the pioneers in studying dancehall. She, as a literary critic, started looking at song lyrics and developed a thesis, a really counter-intuitive thesis, that dancehall is a place that celebrates women’s sexuality and a place that overturns the middle-class prudish ideologies about the role of women and their sexuality. I think that the dancehall is a place about sexuality, so I agree with her to that extent, and it is a place that focuses on women’s sexuality, but I have a slightly different take in that it isn’t necessarily only about liberation. Again, there’s a spectrum of meanings. I think it’s primarily a place about women as sexual objects and men as sexual agents who are the authors of these narratives about their own power of conquest. The songs that are more graphic are referred to as slackness. Slackness has a long history as well. Yellowman was singing slackness back in the early 80s and was king of the dancehall. Before that there were people like General Echo. Before that there was Derrick Morgan. It goes back to ska then back to Mento. This overturning social norms with irony, parody and play is really a part of the Afro-Caribbean tradition. I think Lady Saw is one of the most compelling figures in this whole debate because she’s a woman who has taken the position as the author of slackness. First of all, there are hardly any women deejays and there are only a handful of popular women deejays. Lady Saw, in the mid-90s, was really the queen of dancehall deejaying and had some quite graphic lyrics that were just reversing the male perspective from a female point of view. I saw her at Sting or Sunsplash in 1994 and she came out and she had some God lyrics, some culture lyrics. The crowd was fairly receptive and then she asked them, “Do you want to hear some slackness?” and the place went crazy. She got four encores based on her slackness. This is not an entertainer shoving slackness down people’s throats. There’s a real kind of subversive thrill in hearing these lyrics. LG: You’ve attended many of the dancehall clashes in Jamaica. What constitutes a good clash? NS: A good sound system consists of three things: excellent equipment, from the speaker boxes to the amplifiers and the way the system is strung up, the way it’s put together. The second is the selection of records. What records do you have in your collection? The collection consists of 45s, albums and dub plates. And third, how good are the selectors? “Selectors” is a confusing word for Americans because we would tend to call them disc jockeys, whereas the deejay in Jamaica is the rapper, or “toaster.” Those three things make up a good sound system. The crowd, in most instances, is the final arbiter. In some of the formal events like World Clash in Brooklyn, they’ll have a referee, but he’ll be judging based on the crowd response. Usually there is no referee or judge, just the crowd. So it’s not infrequent that after a dance or the next day out in the streets you’ll hear different reports. If there’s not a definitive knockout (they call it “locking off the sound”) then there’s sometimes debate about who won. But usually it’s pretty clear one way or the other. LG: When you go down to Jamaica now, do you feel like a local or more of an outsider? NS: After living a year down there (1994), I certainly started to feel like an insider. I became a part of the family, and I now have a Jamaican godmother who I’m very attached to. I really felt like I was becoming a part of the society. It’s a gradual process. It’s like any immigrant… You start to be familiar with the culture, understand the language and you feel attached. As a student and researcher, you crawl and dig out things that people there take for granted. I don’t explore Marin, unless people come to visit me. In some ways, I’ve explored things that many Jamaican people haven’t. But when I haven’t been there in awhile, I feel disconnected to what’s happening on a daily basis. And the society is so dynamic that things are constantly changing, especially in the popular culture where every 6 months there’s a whole new crop of performers with hot tunes. And there’s all the new lingo that you’re not familiar with. But usually within a week, I can pick up where I left off, like a soap opera! [laughs] Once you know the basic characters, and the story line you can basically pick up where you left off! In other ways, I will always feel an outsider in Jamaica. Being white. No matter how many people know me, or how much they consider me a part of things, all I have to do is go to the neighborhood next door where no one knows me and I’m a tourist again. And I have to go through the process all over again. There’s a lot of repeating the process that I think even local, white Jamaicans have to go through. But that’s the thing: they weren’t trying to mix in the same circles I was trying to mix with, so they live their separate lives. LG: What has been the biggest obstacle with this book? NS: Other than convincing a granting agency to give me money to go to Jamaica? I think that was the first huge obstacle! Then there were a myriad of minor obstacles in terms of actually carrying out the research. I think one of the reasons it hadn’t been done before was because it wasn’t an easy thing to do. There was nothing that was insurmountable though. I had to work my way into the culture-it was grueling. I think the biggest challenge was coming home and figuring out what story to tell with all of the interviews, videotape and experiences that I had. How was I going to do justice to the vibrancy and dynamism, complexity of the culture? I’m trying to bring the lyrical production into reception. How do people themselves take in lyrics? They may not be analyzing from a critical/ethical point of view… Since I felt that there wasn’t really anything that had looked at dancehall comprehensively, I would have to sacrifice some of the depth surrounding other issues. It took me 6 months of just transcribing tapes and thinking before I even mustered up the courage to write about this. The sacrifices that were inevitable were the biggest challenge. LG: Why do you think dancehall music has become so popular, over roots or lovers’ rock? NS: To me, dancehall is lovers’ rock, and it is roots. This may be the most controversial part of my book, but I say that dancehall is a culture, and it’s a space and a type of event. And there isn’t one type of music that’s dancehall music. Dancehall music is the music played in Jamaican dancehalls. So Bob Marley is dancehall. Burning Spear is dancehall. Yellowman and Shabba Ranks are dancehall. Since the 1980s, there was a style of music that started to be called dancehall music. Before that it was called “Reggae inna dancehall style” with people like Sugar Minott, Cornell Campbell, and so forth. There’s always been a dancehall style, but lately, it’s been called dancehall music with Beenie Man and certain kind of riddims. I’m not a purist that way. I think you can talk about certain dancehall styles that are popular at a given time, like in the mid-90s when you had people like Bobby Digital who were making interesting riddims that weren’t based on the Studio One sounds of live musicians playing certain kind of drum and bass patterns. So, yes, there have been many different stylistic changes and these are referred to as dancehall music. I think that every generation in Jamaica seeks to innovate and make up a sound that is unique to them and not their parents’ music. The whole dancehall culture is so central, the voice of the people, the outlet for young people (primarily boys) to make a name for themselves and it speaks to all of the issues. It is like a soap opera-sexuality, gender relationships, politics, religious meaning. Buddy Goodison said, “It’s a theater of life.” It really is a people’s theater. It’s incredibly vibrant. It has its ups and its downs. It has its international fame, so I think it’s incredibly powerful. And I think the music is very compelling, which is why it’s ultimately popular. LG: Lastly, if you had all of the resources and time in the world, which aspect would you want to explore further? NS: I’d really like to do something with video, like a documentary to bring the visual to an audience. So I think that medium is the next area I’d like to go in. I think it’s like a kid in a candy store and that’s part of the problem-there are so many things that really haven’t been explored and choosing is difficult [laughs]! I’d like to do some more biographical work. This book is somewhat sociological, looking at the larger social structure. I do some biographical portraiture, but it’s minimal, so part of me is compelled to look at some of the personalities and people. With his determination and drive, Stolzoff will no doubt be on the cutting edge with whatever he does next. Whether it’s a documentary on the Killamanjaro sound system with whom he traveled in Jamaica, or teaching anthropology to undergrads, Stolzoff can be proud of the work he’s done so far. He has documented significant cultural and oral history on paper and has both raised and answered questions to further understand sound system culture. Now there is a benchmark of scholarly material from which to work. 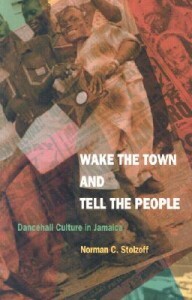 Check out his book, “Wake the Town and Tell the People: Dancehall Culture in Jamaica” (Duke University Press) at your local bookstore or internet bookseller or visit www.wakethetown.com for further reviews and excerpts from the book.